Made with tangy tomatoes and fresh basil, bruschetta topping is loaded with flavor but very short on calories. Trouble can start, however, if you prepare the bruschetta's toast base with too much butter or oil. If you're trying to cut back on calories, use just a light brushing of olive oil on your bread before toasting and don't add any fatty toppings such as mozzarella cheese. 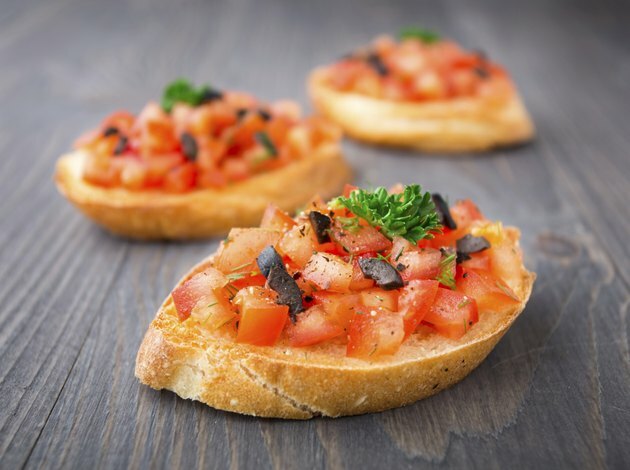 A basic bruschetta recipe from "Fine Cooking" contains 15 calories per tablespoon of tomato mixture. A 1/2-inch slice of long Italian bread -- just over 3 inches at its widest point -- contains about 27 calories, while a 1/4 teaspoon of olive oil contains about 10 calories. Using these guidelines, one piece of bruschetta contains about 52 calories per piece. Be aware, though, that calorie count will vary based on recipe or the establishment serving the bruschetta.